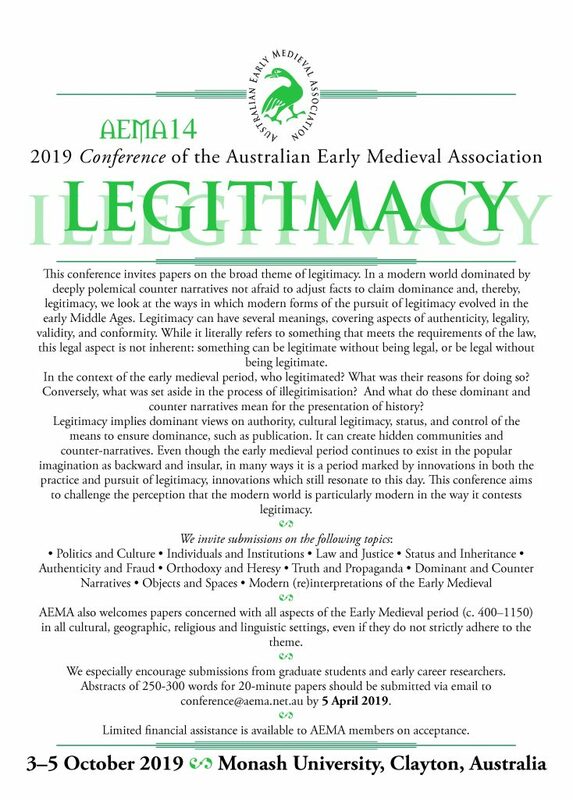 This conference of the Australian Early Medieval Association invites papers on the broad theme of legitimacy. In a modern world dominated by deeply polemical counter narratives not afraid to adjust facts to claim dominance and, thereby, legitimacy, we look at the ways in which modern forms of the pursuit of legitimacy evolved in the early Middle Ages. Legitimacy can have several meanings, covering aspects of authenticity, legality, validity, and conformity. While it literally refers to something that meets the requirements of the law, this legal aspect is not inherent: something can be legitimate without being legal, or be legal without being legitimate. In the context of the early medieval period, who legitimated? What was their reasons for doing so? Conversely, what was set aside in the process of illegitimisation? And what do these dominant and counter narratives mean for the presentation of history? Legitimacy implies dominant views on authority, cultural legitimacy, status, and control of the means to ensure dominance, such as publication. It can create hidden communities and counter-narratives. Even though the early medieval period continues to exist in the popular imagination as backward and insular, in many ways it is a period marked by innovations in both the practice and pursuit of legitimacy, innovations which still resonate to this day. This conference aims to challenge the perception that the modern world is particularly modern in the way it contests legitimacy. AEMA also welcomes papers concerned with all aspects of the Early Medieval period (c. 400–1150) in all cultural, geographic, religious and linguistic settings, even if they do not strictly adhere to the theme. We especially encourage submissions from graduate students and early career researchers. Abstracts of 250-300 words for 20-minute papers should be submitted via email to conference@aema.net.au by 5 April 2019. Limited financial assistance is available to AEMA members on acceptance – please direct all enquiries the conference committee. This entry was posted in cfp, conference on 22 January 2019 by ANZAMEMSComms.